Central Seattle is the core of the Greater Seattle region and has the highest concentration of homes in the county. Starting in downtown Seattle at the waterfront on Elliott Bay, skyscrapers spring up near the the shoreline. Neighborhoods near downtown Seattle present a mix of homes from classic to modern construction. Views of Puget Sound, the islands, mountains, and nearby lakes are apparent in every direction from Downtown Seattle. Just north of downtown, Belltown also has a large number of high-rise condos, with quick access to the downtown business district and plenty of entertainment nearby. Downtown Seattle and Belltown give way to First Hill in the East, which houses a large portion of Seattle's medical buildings and a fair share of condo towers as well. To the south are Pioneer Square and the International District, each with a strong urban vibe and a mix of small homes and lofts. As one heads east and north further from Downtown Seattle, homes are more likely to be low-rise and in more residential areas. 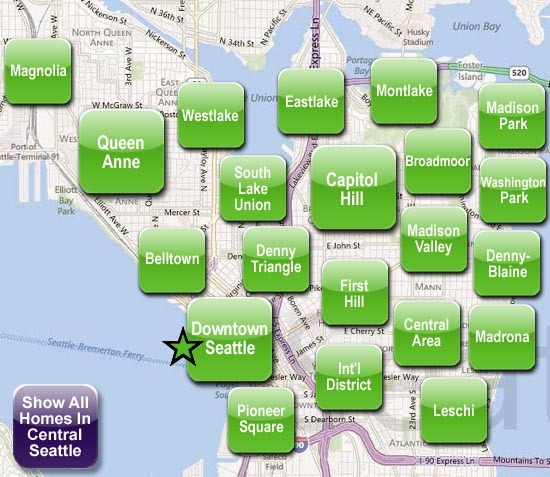 Although there are exceptions, popular neighborhoods like Capitol Hill, Queen Anne, Madison Park, Eastlake, and South Lake Union have a large number of low to mid-rise buildings that are still just a quick commute into downtown. There are a wide variety of homes in Central Seattle, from traditional to foreclosures and short sales scattered throughout. Houses include classic Victorian, Craftsman, and Tudor homes, as well as plenty of new construction and modern architecture. There are also some unique homes such as the waterfront condominium buildings in lakeside communities like Leschi, Washington Park, and Madison Park. Central Seattle homes offer views from nearly every neighborhood, and the popularity of these in-city locations create strong real estate values and high demand.